Well, the part about the beer prices is untrue. A bottle of Rolling Rock at The Junction will still put you back $3.50, hardly competitive with other Omaha venues, such as The 49'r. That said, the rest of the description of "The New Junction" is pretty much spot on. The place has been rearranged, with the stage now at the back of the room. The round pleather booths are still there, they've just been moved to where the stage used to be. The ceiling tiles over the old stage area have, in fact, been replaced, and overall, the club has been cleaned up. Other changes include moving the pool tables to the front of the bar (where the booths used to be) and placing the pinball machines (for the connoisseurs, we're talking Attack from Mars and Gone Fishin') on either side of the pole that used to block the view of the stage. With those changes, the venue almost doubles the capacity for watching a band. There's even a cyclone fenced-in area off to the side of stage-left with second-hand couches and tables. Nice. But there are also drawbacks. The area in front of the new stage (almost twice the size of the stage itself) is completely vacant, and tends to stay that way when the bands are playing. As a result, it looks like the performers are playing to an empty room, when in fact everyone is congregated in the dark booths some 30 yards away. There's also a problem with the sound equipment. The house system wasn't being used last night (apparently some critical parts were being used at another venue down the street). Sound was provided by Matt Whipkey, the evening's first performer (it's the same set up he uses for shows at The 49'r). For the 50 or so people who showed up, the sound was pretty damn good. 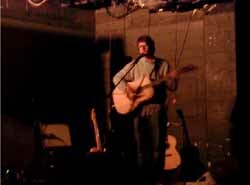 Whipkey opened with a solo set performed alternately with electric and acoustic guitars. The solo versions of songs he's played with his old band, The Movies, managed to hold the same intensity, though Matt looked rather lonesome flailing around on stage all by himself. Fizzle Like a Flood, a.k.a. Doug Kabourek, used the gig as a CD release party, playing solo which was appropriate seeing as his new CD is mostly solo acoustic "demos." Having seen Doug play about a dozen times, this marked his best solo performance, though afterward he complained that he couldn't hear his guitar in the monitor (I didn't even see a monitor on stage). 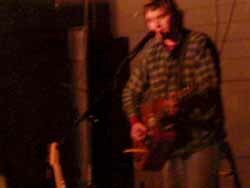 Then along came Dave Dondero. Everything I've heard about him was true -- he's pretty amazing. His set, while subdued and withdrawn, was riveting. Dondero is a throw-back to classic American folk singers, taking a distinctively traditional style and placing it squarely in our time with lyrics that are introspective and rooted in the everyday. The comparisons to Simon Joyner and Conor Oberst are justified (or for that matter, their comparisons to him). He looked disheveled and lost, lonely as the other two artists on that same empty stage with its one bright white light. Never smiling. Acknowledging the applause by squinting through the glare, as if looking for a sailboat lost far away on the horizon. While The Junction is drastically improved over its former self, it's gonna take some work to get it placed in the same category as Sokol Underground or The 49'r. For one thing, it needs a functioning sound system. Then there's the drink prices. I heard one patron (a hipster girl dressed in a '70s coat with frilly collars and a hippy cap) say "I hate this bar" as she was leaving, complaining about the drink prices. Just like old times. I, for one, continue to like the club and see only potential (especially for smaller touring indie artists) but only if the owners do what needs to be done to make it a suitable venue. If they don't, they're likely to find themselves looking in vain for someone to book the joint. And that would be a shame. back to Posted Nov. 30, 2002. Copyright © 2002 Tim McMahan. All rights reserved. 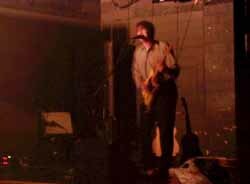 Dondero looked disheveled and lost, lonely as the other two artists on that same empty stage with its one bright white light. Never smiling. Acknowledging the applause by squinting through the glare, as if looking for a sailboat lost far away on the horizon.